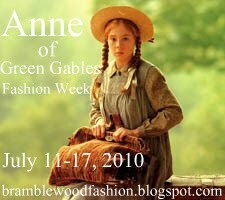 Bramblewood Fashion | Modest Fashion & Beauty Blog: "Anne of Green Gables" Fashion Week has officialy begun! "Anne of Green Gables" Fashion Week has officialy begun! Today is the start of the week long fun event, Anne of Green Gables Fashion Week! I am so excited to be hosting my very first event! After participating in all of AmandaBeth Online's events and several other others, hosted by various bloggers, I decided it was high time I hosted one myself! Remember, you don't have to do just fashion posts. Here is a refresher on all of the different categories you can do posts on through out the week. When you write up your posts, do include in your post (or title) what category it is for. This will make it a lot easier for me, when I go through all the posts and organize them for voting for all of the winners. Also include a link back to my blog in your post. And please remember, when linking up your post each day in Mr. Linky do a direct link to your post, NOT your blog. I'm excited! I'll be posted some fashion pics later in the week.